Lisbon’s Saint George castle is hard to miss, perched at the top of a hill in the heart of the old city. Dating back to the mid-11th century, and with evidence of fortifications on the site as far back as Roman times, this national monument is a prominent part of the downtown skyline. Unsurprisingly, it’s one of the biggest tourist attractions in the Portuguese capital. If you’re planning a visit yourself, knowing a few things in advance will help make the most of the experience. From ticket prices to opening hours, attractions to the best way to get there, and plenty more, read on for the complete guide to visiting Castelao de Sao Jorge. Lisbon is a hilly city, especially in the downtown area, and like many castles, the Castelao de Sao Jorge was built on high ground with defense in mind. The end result? You’ve got a steep climb in store before you even get to the entrance gates. Particularly in the heat of summer, the walk up through the historic Alfama and Graça neighborhoods to the castle can be as exhausting as it is fascinating. If you have mobility issues or are just tired from a long day of exploring, you may want to consider an alternate mode of transport. The famous number 28 tram runs nearby, as does the small E28 bus. There are also plenty of tuk-tuk and taxi drivers around the city who will be more than happy to drive you up the narrow, winding streets for a few euros. If you do decide to walk, signposts point the way at various intersections, but if you’re going uphill, you’re likely heading in the right direction. Expect to take 20-30 minutes to get from the river to the entrance, longer if you decide to take a break for a coffee and pastel de nata halfway! Once inside, the castle grounds themselves are mercifully flat, although uneven ground, steps, and stairs up onto the ramparts make parts of it unsuitable for wheelchair users. Depending on your energy levels and enthusiasm for medieval history, expect to spend between one and three hours at the site. Food and drinks are available onsite, so you can break up the sightseeing with refreshments as needed. Be sure to wear appropriate footwear if there is any rain in the forecast — the cobbled steps can get quite slippery when wet. Even in dry conditions, though, you’ll be doing plenty of walking, so comfortable shoes are a must throughout the year. The ticket office is located just outside the main entrance gate, and although lines can be long during peak times, they usually move quite quickly. If you’re visiting in summer and want to avoid waiting in the heat, plan your visit for when the castle opens to visitors at 9 am, or take in the sunset shortly before closing time. People quickly disperse throughout the extensive grounds after entering the site, so you’re unlikely to feel too crowded once inside. Be aware of pickpockets outside the gate during busy periods. While the Castelao de Sao Jorge’s choice of location was based on security rather than scenery two thousand years ago, it now boasts some of the best views in the city. With white buildings and red roofs stretching for miles, plus the Tagus river and its famous 25 de April suspension bridge, it’d almost be worth the admission price for the photo opportunities alone. Of course, there’s far more to the castle than just its views. For fans of military history, check out the cannons dotted along the ramparts in the main square just inside the entrance, as well as the bronze statue of Afonso Henriques, the first king of Portugal, who reconquered the castle and the city from its Moorish occupiers in 1147. This is also a good place to seek shelter on hot days, under the shade of one of the large trees in the plaza. A small kiosk nearby sells hot and cold drinks and other refreshments. Once you’ve finished admiring the armaments, views, and resident peacock population in the square, it’s time to check out the rest of the citadel complex. 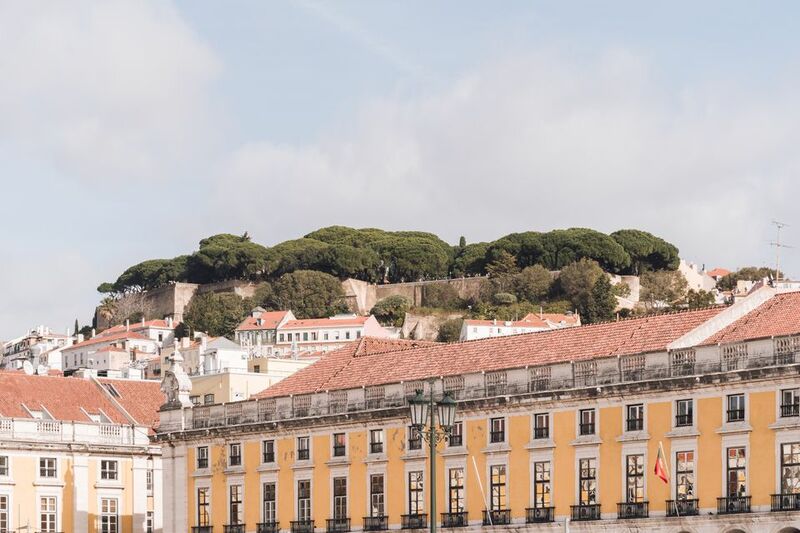 Close to the square lies the remains of the royal palace, a once-impressive set of buildings that were severely damaged in the 1755 Lisbon earthquake that destroyed much of the city. A few rooms have been rebuilt, and are now used to house the permanent museum exhibition, as well as the castle’s cafe and restaurant. The exhibition contains artifacts found on the site and historical information about the castle and surrounding area, with a particular emphasis on the Moorish period of the 11th and 12th century. The castle itself sits at the highest point of the hill, designed to be the final stronghold in the event of attack. A walkway sits atop the walls and multiple towers of the castle, giving yet more great views of the city from a different vantage point. It’s accessible via a series of staircases. Inside one of the towers sits a camera obscura, a darkened room displaying a 360-degree projection of Lisbon via a set of lenses and mirrors. This method of viewing the outside world dates back to at least the 16th century, and was the precursor to modern-day photography. A small range of guided tours are on offer, covering the camera obscura, the castle itself, and most interestingly, the archaeological dig site that’s not otherwise accessible to visitors. There’s evidence of settlement as far back as the Iron Age, and tours of the site run roughly once an hour from 10:30 am. From March through October, the castle closes at 9 p.m., while from November through February, you’ll need to be out by 6 p.m. It’s open seven days per week, closing only on May 1, December 24, 25, and 31, and January 1. In 2019, tickets cost €10 for adults over the age of 25. People ages 13 - 25 cost €5. Younger children are free. Seniors and people with disabilities all pay €8.5. You can find full details of opening hours and ticket prices on the website.